I love March for a few reasons: daylight savings time begins, theoretically it stops being so cold, the Chicago River gets dyed green, and the official start of SPRING! But I especially love that March is Women’s History Month and we get to spend 31 days celebrating daring, genius, funny, complicated, important, strong, wise ladies. One of my favorite things about writing historical fiction is getting to explore the lives of real, and sometimes famous, women—like Alice Roosevelt. When Audrey Met Alice allowed me to spend a lot of time researching the women who have made 1600 Pennsylvania a home in addition to a historic site. (Check out the Resources page of my website for more information on my research, along with a Women’s History Month lesson plan.) But this month, I wanted to devote some words to other female historical figures I find inspiring. Each Wednesday this March, I’ll share a short post about a fascinating woman in honor of Women’s History Month. I’d love to hear which women interest and inspire you–please tell me in the comments! I’ll (randomly) choose one commenter on each post to win a preorder of the new When Audrey Met Alice paperback. Tweet about the women who inspire you with the hashtag #WomensHistWednesday for an extra entry. Maybe you’ve noticed, while heading in or out of O’Hare airport, that you get to the terminals via Bessie Coleman Drive? It’s a fitting tribute to the former Chicagoan, who was the first African American woman to get a pilot’s license. While Bessie worked as a manicurist in Chicago during World War I, she listened to airmen tell stories about their flights, and it piqued her interest so much that she began to study aviation. At the time, no flying schools in the United States would admit an African American woman—so Bessie first attended the Berlitz school in the Loop to learn French, then moved to France. There she learned to fly in just seven months and earned an international pilot’s license in 1921. Upon returning to the United States, Bessie earned a living doing aerial tricks and stunts across the country. 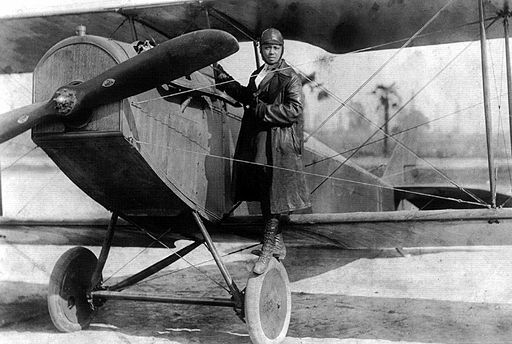 She hoped to make enough money to start a school for African American pilots. Tragically, she died at age thirty-four in an airplane accident–but her legacy lives on. I must admit as a Nurse I feel I should say ” Clara Barton or Florence Nightingale” inspire me. They do on a professional level. But truth be told it’s the single working moms out there who truly inspire me. As a caretaker, mom and wife (married for 17 years) I at times get overwhelmed and frustrated when things don’t go my way. Then I look around and see all the moms doing it all, solo. I find inspiration in their journey in making a better life for themselves and their kids. They are a fierce sight to behold. Thank you for this wonderful response! I wholeheartedly agree–I’m kind of in awe of the single moms I work with at my day job. They show so much strength and determination, and love for their kids. I’ll give you two historical women of inspiration: Marie Curie who won the first Nobel Prize in Science and Joan de Arc who led the French Army. If you wish a contemporary woman then it will be Angela Merkel, the Chancellor of Germany. Excellent choices! I read a biography of Marie Curie last year–she lived a fascinating life. Thank you, Giora! I’m currently researching Barbara Strozzi, a 17th century Venetian composer, and she’s inspiring in her own right. But in that research I’ve uncovered Arcangela Tarabotti, a Benedictine nun who was forced into the nunnery like so many other young women in her time whose families simply didn’t want to spend money on their dowries. She published some blistering proto-feminist books about the role of women in Venetian society, writing about women’s need for education and rooms of their own in which to write long before Virginia Woolf. (Not to diminish Woolf’s work, of course.) Considering few Venetian women at that time knew how to read and write at all, they were incredibly revolutionary ideas. Both sound like amazing women! I have fuzzy recollections of a nun in Golden Age Spain who was also a mystic–Maria Vela y Cueto. I read some of her writings in a college class years ago. They weren’t proto-feminist from what I remember, but they were fascinating. I’m going to look up Arcangela Tarabotti because she sounds awesome. Comments are now closed for this post–check back tomorrow to see who won a preorder!